Slatted mattress bases can cause endless frustrations for bed owners. What mattress is suitable? Which type is best? There is no justification to say whether one type of slatted base is better than the other but both come with their own set of benefits and problems. This article explains what to look out for and tips when using a slatted base with a mattress. Firstly, nearly all mattresses are suitable for nearly all bed bases/frames but you do need to take some precautions if you’re opting for a slatted mattress base. It’s a known fact that they may be lighter and cheaper but they also provide the weakest form of mattress support. Perhaps there may be a disclaimer here with cheaper one-sided mattresses where there is insufficient wadding on the non-use side. Making them unsuitable for slatted bases as they start to warp to the gaps between the slats. Highly upholstered mattresses, such as our Artisan range, Vi-spring or Savoir beds will most definitely need more support than a standard slatted base and so some tweaks will be required to the slats. More on that later down the article. What mattresses are suitable for bed frames? Are John Ryan Mattresses suitable for slatted bases? Solid slats which are just thin planks of wood extending across the bedframe. 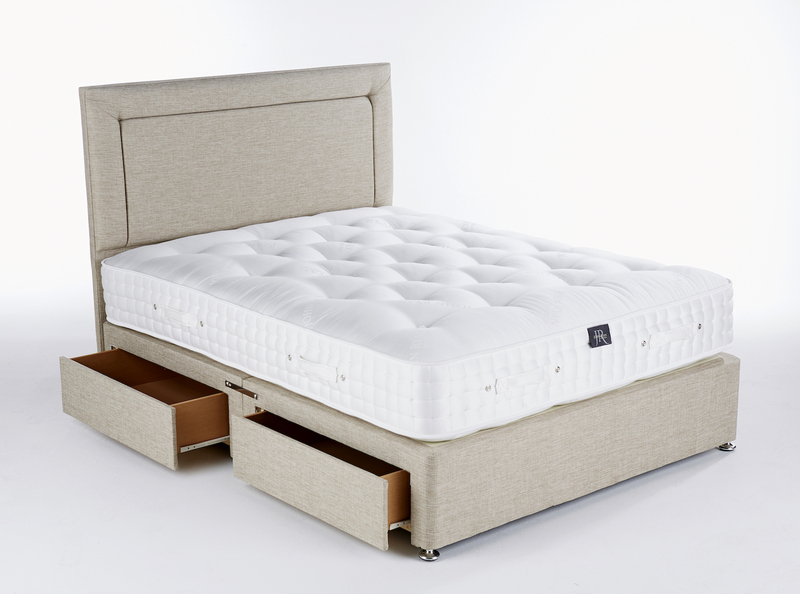 There are many anecdotes on this site and throughout the internet where the mattress develops a central dip known as ‘The Hump Back Bridge Effect’ and this can easily be attributed to the use of a slatted bed frame where the pressure of the slats (the arches) are too firm to ‘give’ under the weight of mattress and user and, therefore, the mattress is prone to settling on the central support bar. There are of course associated reasons why this happens. The mattress itself can be so unsubstantial and lightweight that the arches on the slats are pushing the internal spring unit out of shape. The underside wadding of the mattress (one sided no turn) has such an inadequate level of support upholstery that the springs are practically forming on to the slats. On the lower priced bedframes the slats tend to have far too wide a spacing between them and again, particularly with the one-sided no turn mattresses the individual pocket springs themselves will have no underside support and subsequently be ‘falling’ through the slats. This does sound so much more dramatic in theory than actuality, but the principle is there. By contrast, on traditionally built double sided mattresses, there will be/should be! More than sufficient fillings and wadding to add an extra element of cushioning between the springs and the slats to act as a dampener. Solid slats do have the advantage over sprung slats as a better surface for all pocket sprung mattresses. The thing to remember is that a pocket sprung mattress requires a flat even surface in order for the mechanics of the individual springs to work with the sleeper. 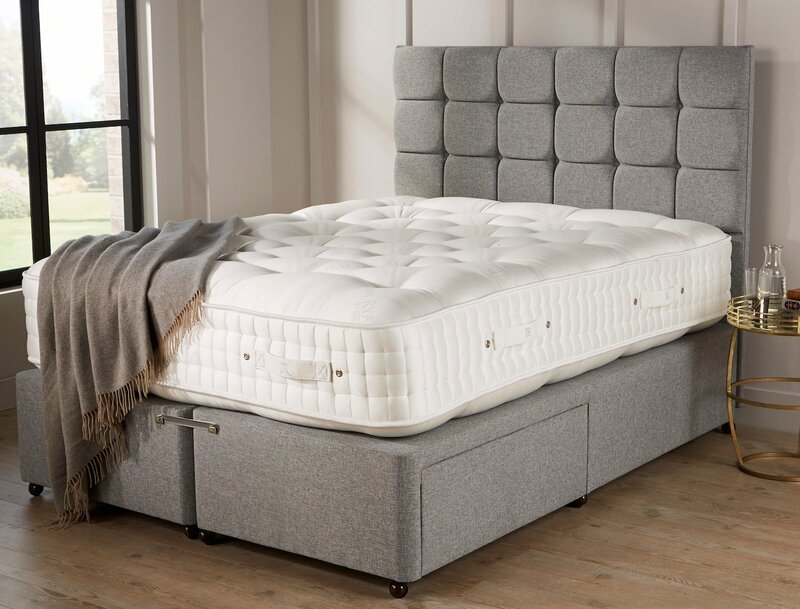 If we take a lead from all the high-end manufacturers of pocket sprung mattresses, we see that they are all partnered with a Sprung Edged Divan Base. The suspension qualities of a sprung edged base are precisely what the sprung slats are trying to replicate but not too efficiently I might add. 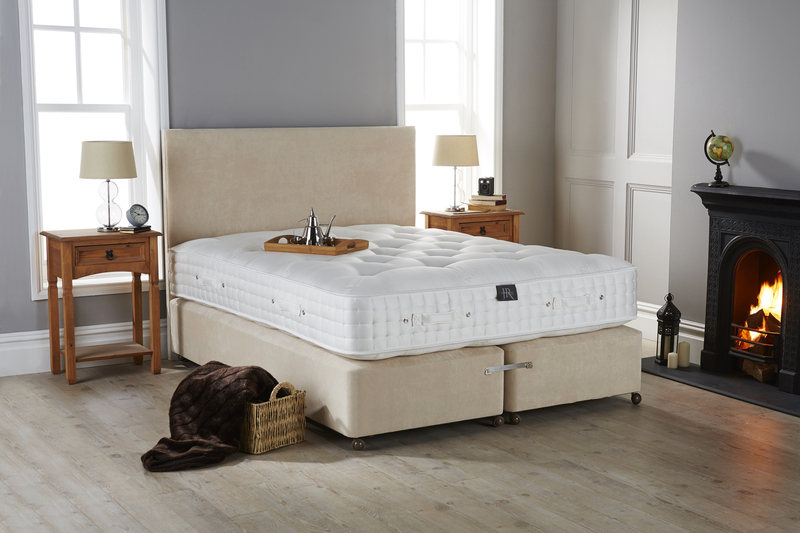 There is a considerable difference in user comfort levels between a mattress on a sprung edged divan base, and a mattress on a sprung (or solid) slatted base. Pocket springs work best when there is a system of gradual suspension. This means that as the weight applied to the mattress is under duress, the springs in the mattress takes the strain and the springs in the base cushions the blow if you will. How to prevent slatted bases damaging a mattress? I have to point out here that to fully understand this post you will have to read the posts on spring types, divan bases, mattress upholstery and wadding etc. You will soon come to realise everything to do with manufacture and usage will depend upon a number of variables. Use these articles as an initial line of questioning, but bear in mind that they only just scratch the surface and a great number of other factors will have to be taken into account. A mattress placed directly onto a slatted base with no cushioning whatsoever. This will also cause the mattress to gain unsightly and potentially damaging ridges into the underside of the mattress upholstery noticeable when you turn your mattress. At the very least you should be placing some sort of cushioning foundation directly onto your slats to prevent this happening such as an old duvet etc. 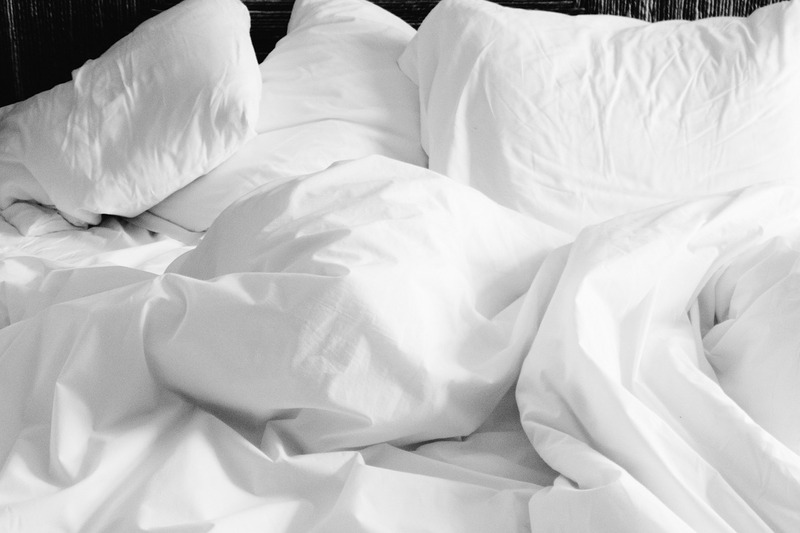 There are products sold as mattress pads for this very reason but these are very minimal in construction that the duvet thesis is a far better and more affordable solution. To address the issue of the desirable flat surface for your mattress when used on a sprung slatted base, you should really be taking measures to do all you can to achieve this. The best method we have found is to place thin sheets (about 3-6mm) of MDF onto your slats, to create the flat even surface required. This image shows three lengths of MDF sheets bridging the arched slats and central bar to prevent the central dipping problems. They are also not so big as to prevent any problems with aeration to the mattress. This has been topped off with a substantial feather topper to add an element of cushioning to the underside of the mattress. To prevent the topper slipping when the mattress is turned I have placed the corner ties on the topper between the noggins on the slat inserts. As stated above there ‘will’ be a comfort difference between a mattress used on a slatted base and the same mattress used on a sprung edged divan. What is a Bedframe or Bedstead? This a term thrown about that, in reality, is quite meaningless and, in my opinion, can be quite a cause for unnecessary concern. 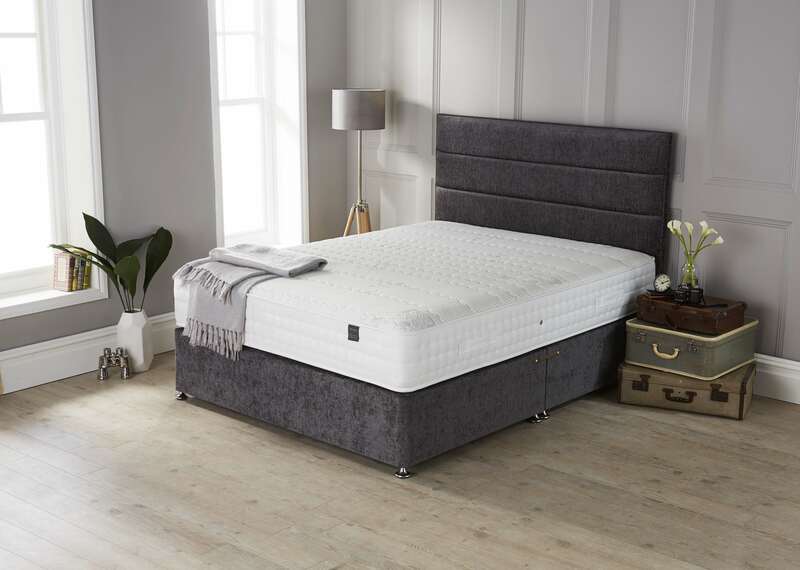 If we look at Vi-Spring as an example, they offer two types of mattresses in their range under the heading ‘Bed Collection’ and ‘Bedstead Mattresses’. Their top of range mattresses such as the Magnificence and the Signatory fall into their ‘Bed Collection’ headings. They are often accompanied with a bedstead. Does this mean you have to use a bedstead with the mattress? Will you have to opt for a lesser model? No of course not, you could use any mattress with a divan or sprung edge divan base instead. 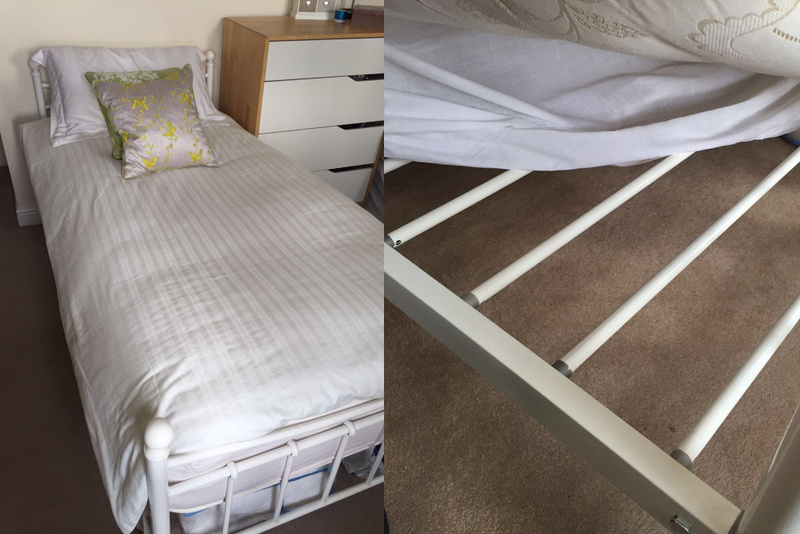 If we look at the construction between these two ranges of bedsteads we see that the only difference is the inclusion of a wool spring protector pad on the mattresses deemed fit for use on a bedstead. This is the component directly on top and bottom of the actual spring unit and the following layers of upholstery can be deemed similar to the models within their Bed Collection. The wool spring protector pad will be within a 500 GSM tolerance and although compressed and slightly firmer than the usual 1000 GSM bonded wool and cotton as the insulator used for the bulk of their models, I cannot see any reason to differentiate between these two ranges. If the returning argument is that there has to be a more substantial spring insulator for mattresses used on a bedstead, then surely this negates the benefit of having a completely pliable calico spring unit in the first place. I really can’t understand it, particularly from a manufacturer of this calibre. We always advise with our hand-made mattress range that if you’re going to use a slatted base you board over the slats. This is due to the fact that compared to most ‘shop bought’ retail mattresses, our range are much heavier. This is due to the vast amounts if fillings within them compared to shop bought mattresses. If you don’t board over the slats with mdf or pegboard over time the weight of the mattress can mean it conforms to the gaps between the slats, especially true with latex. We have also found that slats can nip and bite the mattress fabric over time causing tears and snags, by boarding over and using say a cheap duvet to cover the base you can avoid having your slats damage the mattress. 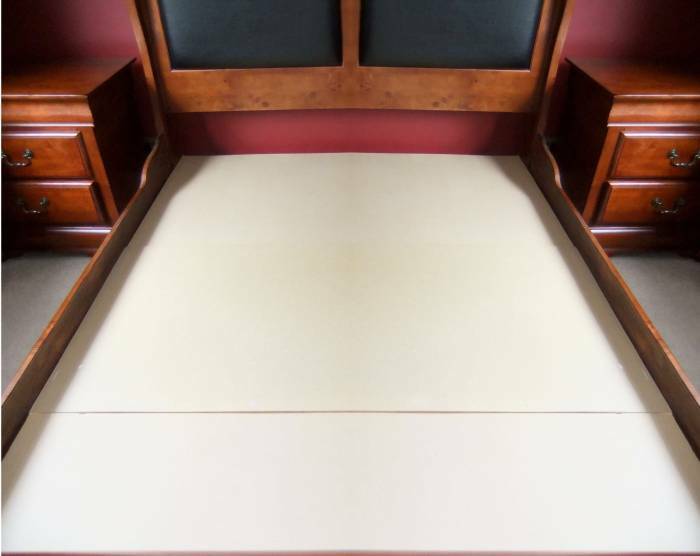 What’s the ideal base for a foam mattress? The best answer is to go for a platform or sprung edge divan ideally. This ensures a consistent surface and removes the issue of slats causing dipping or damage to your mattress. Whilst a nice looking bed frame is a consideration when buying a new bed, you also have to weigh this up against the impact of certain slatted bed frames. Particularly against your mattresses longevity, comfort and consistency. As you will read in the comments below we have had prototypes of a sprung mattress pad made to address the issue of the lack of gradual support between the mattress and the base. We did try these on a bedframe and the theory does work with a noticeable increase in overall comfort. However, these prototypes did come in at a depth of between four and five inches in height and coupled with the height of the mattress (10 inches) completely dominated the bedframe. The headboard was dwarfed and the tail board was completely swamped. If you want to see how we have incorporated the base pad idea into the Legacy mattress have a look here. Slats are fine as an entry level mattress base provided they are not spaced too far apart and you board over them. If not you can end up with sagging mattresses or even rips and tears in the mattress fabric. The best way to avoid the hassle of slatted bases is to choose an upholstered divan. Saving the need for any boarding over or tweaking. We are have developed a Luxury mattress base pad for our Legacy mattress but have yet to create one suitable to remove the issues for normal slatted bases. This is because they make the mattress too high. We at present offer a range of divans which can be used with your existing mattress or one of our models. If you need more help please call our friendly team on 0161 437 4419.